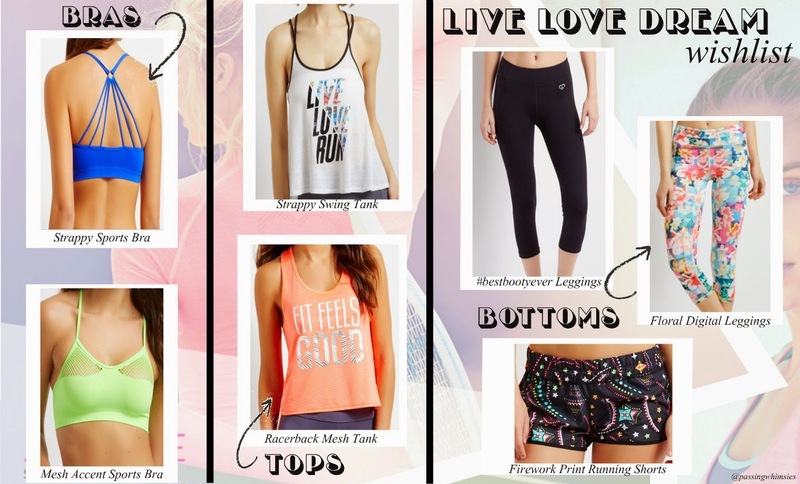 I did some floor sets for Aeropostale when I was home over spring break and got a chance to put out the new Live, Love, Dream merchandise that is Aero's workout/lounge line. Aero's had the line for about two years, but I've never paid much attention to it since I didn't work out. Since I've really been getting into fitness the past two months though, it was hard to display these pieces and not want it all! So, I made up a little wish list of the things I really loved from the new line. The clothes just make me so happy and excited to work out with their bright colors, patterns, and special design details. Unfortunately, I had to go back to Kent before I could try anything on, but I think I might try and go back out to Aero when I'm home for Easter and look more extensively. All the work out clothes I have are from when I ran track in 8th grade (ha), so a few new pieces would be motivators for me to keep pushing myself and working out!